Doom on Rockbox is playable even on lower-end devices, it can be very fun despite limited controls. 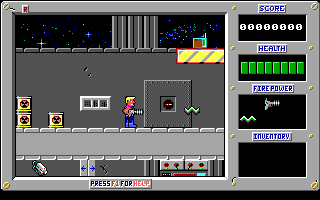 I even see talk of Duke Nukem 3D ports so why has nobody considered the more-fitting Duke 1? I would suspect it can probably play on just about anything in regards to processing power. Doom beautifully and Rockboy halfway decently...lol. Thanks for checking out the post, folks. I could be wrong, but after a minute on Google I don't think source code is available for Duke 1. If it was possible to get Dosbox running, I expect such lightweight games would work that way. User890104 got an x86 emulator running Alley Cat recently. You could look into that and see if it'll run Duke Nukem. Be warned that it seems to be in a very early state of development. Please keep in mind that I'm going to completely redo the way this emulator works, so it uses __builtin's SDL runtime. The current version includes some dirty hacks like modifying the plugin buffer, and a hardcoded screen resolution to match iPod Classic.